Do you ever get in a rut when it comes to dinner ideas? Every once in a while we make breakfast for dinner. Breakfast is one of these easiest meals to prepare, don’t you think? Living in the South has introduced us to many different dishes. 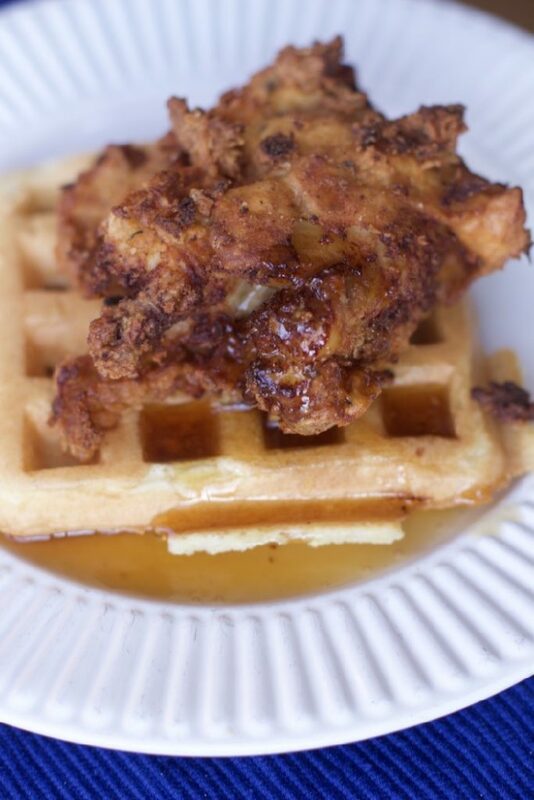 At one of our favorite restaurants in Richmond, they serve Chicken and Waffles for brunch. 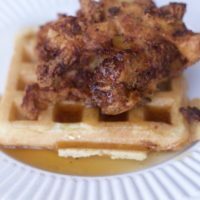 I am not a big fan of this for breakfast, but when I was in need of a delicious and hearty dinner idea, Chicken and Waffles came to mind. 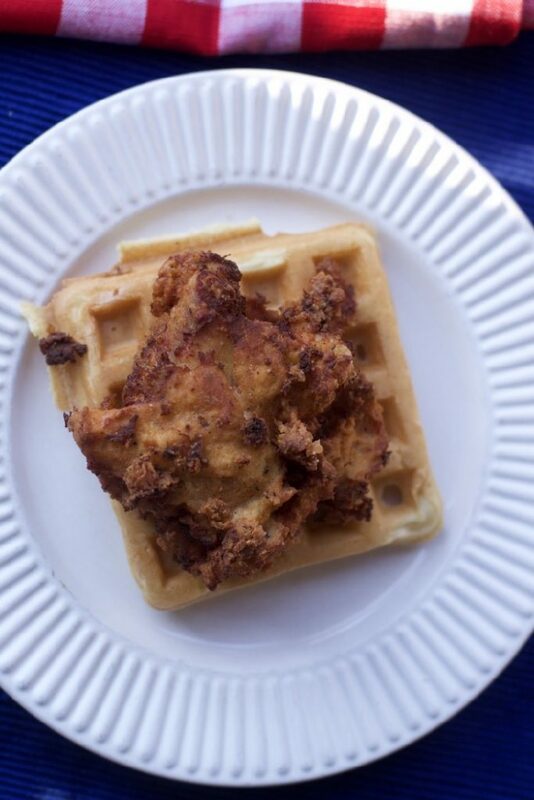 Full disclosure, I have never made Fried Chicken before… Thanks to Krusteaz for helping provide samples and grocery money to create this awesome breakfast for dinner recipe. Did you know that February is National Hot Breakfast Month? Can’t wait for you to check out this amazing breakfast for dinner recipe that is well worth the effort. 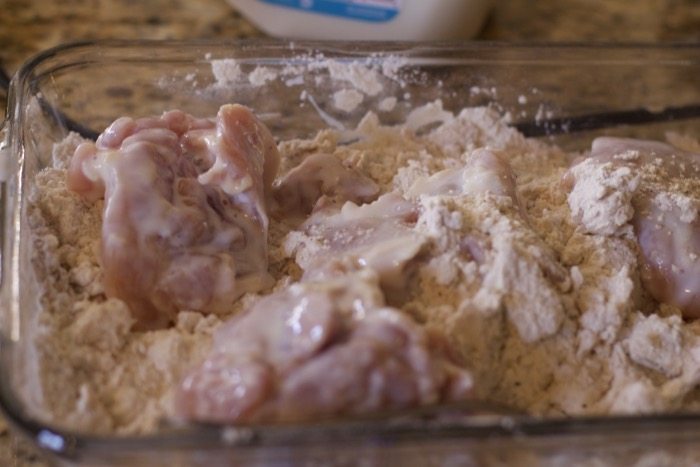 I googled a few ways to make fried chicken and of course they all say to soak your chicken in buttermilk overnight. The messiest part was getting the coating on the chicken thighs. We used boneless thighs although the restaurant we get this its, bone-in chicken. This was our first attempt at fried chicken and the rookie mistake was we didn’t wait for the oil to get hot enough or what we thought was hot enough. The first batch did not brown well. Of course you can always use an Air Fryer which will be healthier and probably less messy, I have never used one but gear great reviews. Had no problem getting the next couple of batches the perfect golden brown… maybe even too golden. This recipe calls for putting the chicken in the oven to complete cooking. Once the chicken is made, and I made it earlier in the afternoon and kept it in a warming drawer. 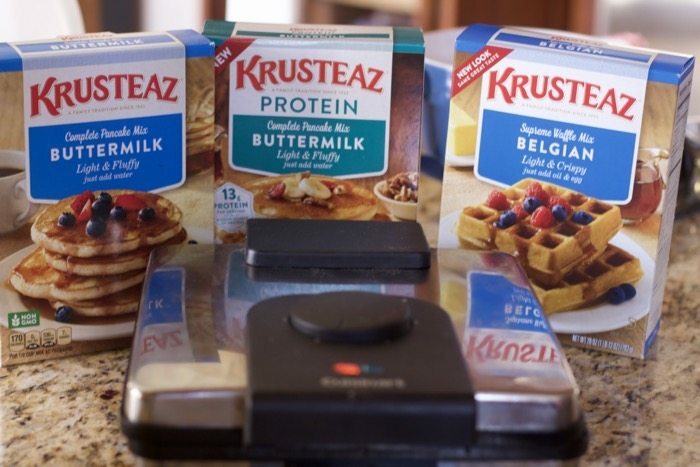 When it was time to serve up dinner, I pulled out the Krusteaz mixes. These mixes make it so easy to have pancakes or waffles any day of the week. Simply follow the directions on the package. 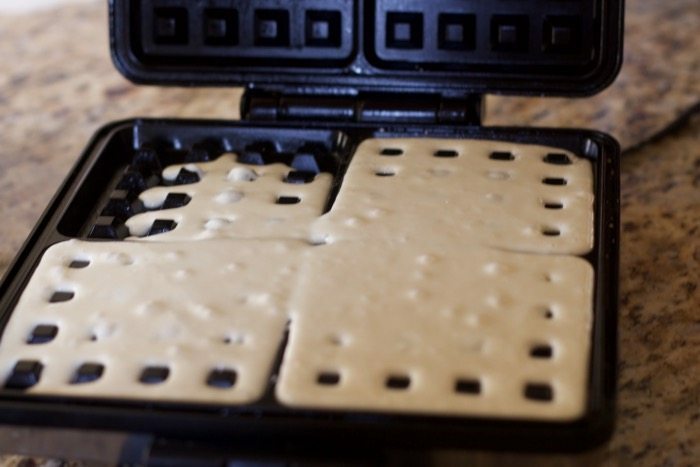 In minutes you have batter and the waffle maker does the rest. Now it’s assembly time. 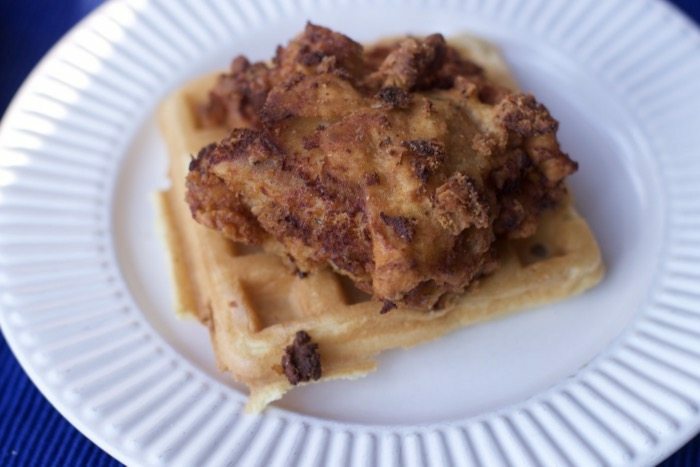 It’s as simple as a waffle or two and a piece or two of chicken. It’s not done yet. What goes with waffles? Syrup, of course, warm real maple syrup with a tab of butter. 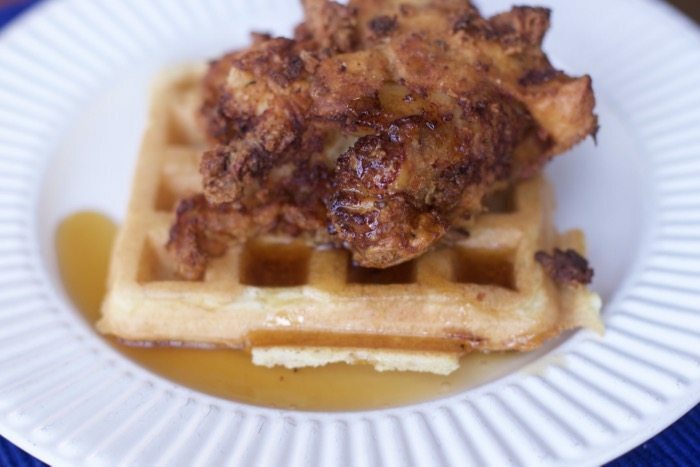 You will be surprised how much the syrup compliments the fried chicken. It is time to take a bite of this sweet and savory dish. Trust me it is a combination you would never expect. In the meantime, preheat the oven to 350 degrees F and mix the breading. Put the flour, seasoned salt, paprika, pepper, thyme and cayenne in a wide baking dish and stir together well. Gradually pour milk and remaining 1/4 cup buttermilk into the flour mixture and, with a fork, gradually mix until there are little lumps throughout. If necessary, add a little more flour or milk to the bowl in order to make it slightly lumpy. Add the chicken to the oil 3 or 4 pieces at a time. Cover the skillet and fry for 5 to 7 minutes, checking occasionally to make sure the chicken isn't getting too brown. Turn the pieces over, cover again and cook 3 to 5 minutes more. All the while, monitor the temperature of the oil to make sure the chicken doesn't burn. 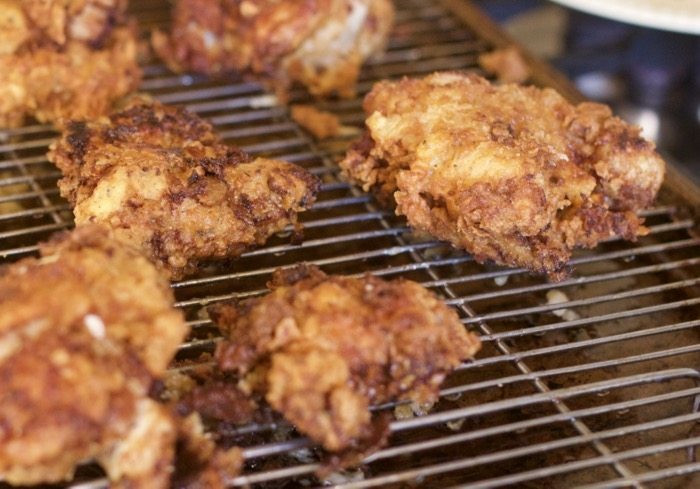 Transfer the fried chicken pieces to a baking sheet fitted with a cooling rack. Bake the thighs for 15 minutes to finish the cooking process. Cover and keep warm. For the waffles: follow the box directions. Pin this to have when you are ready to try this staple of the south. 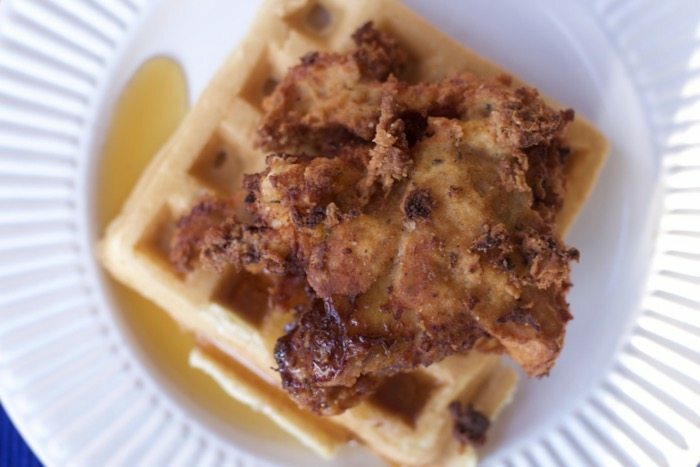 Chicken and Waffles Recipe. 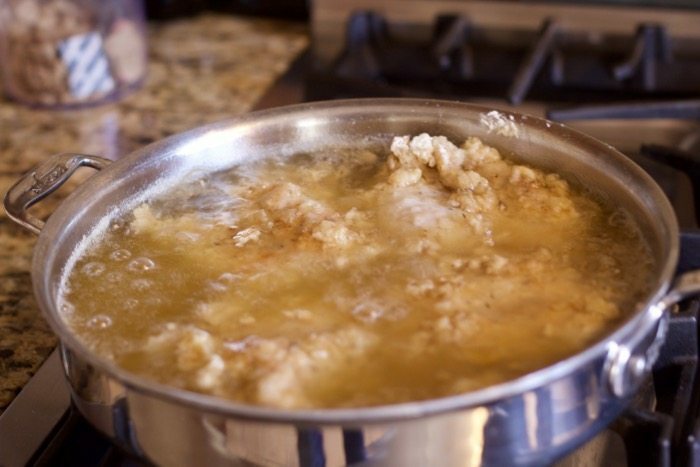 If you are not interested in frying up the chicken you can buy some of your favorite fried chicken places or bake chicken and waffles.